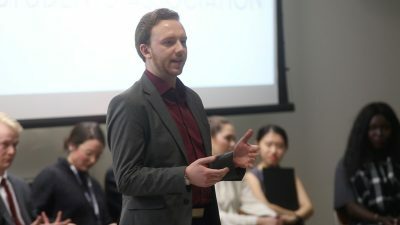 Students were looking for vice-presidential (external) candidates to prove they would be the best lobbyists for international students at the International Students’ Association’s second annual Students’ Union elections forum. Despite their many advocacy points regarding international students, the three candidates were forced to admit that they had never visited the ISA’s office. Many students at the forum expressed their frustration with the lack of progress on issues like rising international tuition rates. 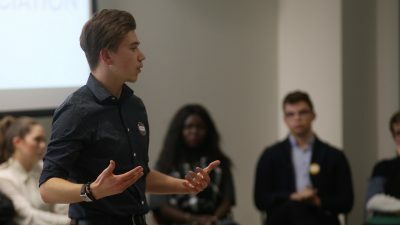 One student asked why the candidates think they will be able to push for a freeze on international tuition when the current Students’ Union executives and their predecessors have been unable to make any movement on that point. 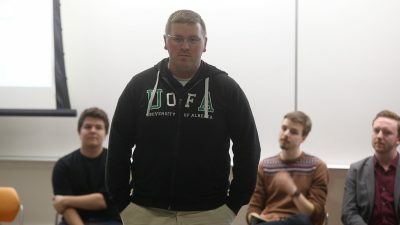 Candidate and education councillor Jimmy Thibaudeau said advocacy can take a very long time, and that the Students’ Union needs to keep pushing the provincial government to see international tuition rates as a serious issue. Adam Brown, a candidate and the president of the Campus Saint-Jean faculty association, said he would be more successful because of his experience with student and provincial governance. He also said he would share the personal stories of international students to humanize them to the government. 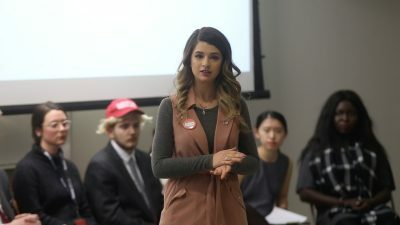 Taking a different strategy, candidate and vice-president (social) of the Undergraduate Psychology Association, said she would use research and facts to convince the government of the importance of international students to the community. The candidates were also asked how they would remove barriers to international students getting involved in student politics. Listed barriers included the requirement for international students to take at least three courses per semester to keep their student visas. Many view it as impossible to be a Students’ Union executive while taking that many credits. Thieba said she would work with the ISA, as well as resident assistants who are international students, to form a coalition to advocate for change together. Brown didn’t offer a tangible solution, but said he would look and see whether barriers can be removed in the short and long term. Finally, Thibaudeau focused on the barrier of international students only being allowed to work a maximum of 20 hours per week, but said that instead of advocating to raise that cap he would push for grants for international students. 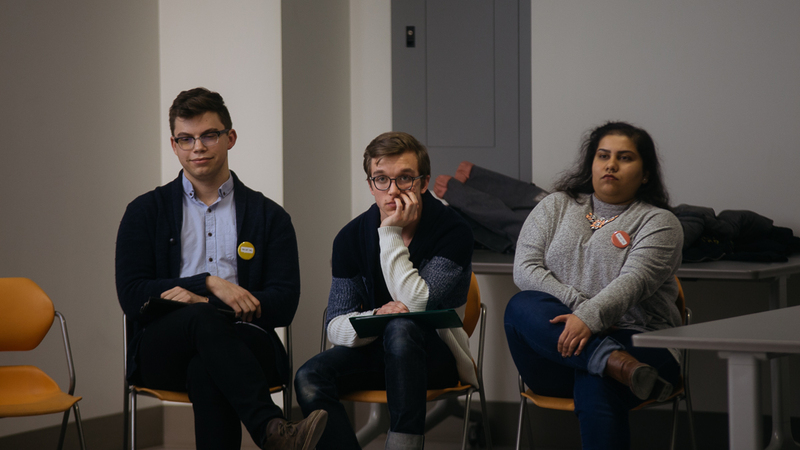 Near the end of the forum, the candidates were reminded that provincial politics will likely be volatile this year, and were asked what other bodies they would advocate to secure resources for international students. Each candidate answered the question differently. Thibaudeau’s answer was short. He said he would also work with the federal government on specific issues like the number of classes and amount of work international students can do. On the other hand, Thieba said she would work with the City of Edmonton and other local universities. Finally, Brown said he would look at how immigrant help centres could help international students through financing and programming. 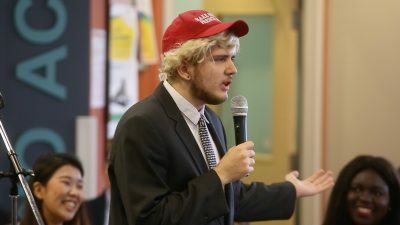 Although he ’s a parody of Donald Trump, joke candidate Donald Straump took a surprising and very untrump-like approach to the International Students’ Association forum. In his opening statement, Straump declared he would not be taking any questions. Vice-president (operations & finance) joke candidate Donald Straump. Students’ Union business promotional coordinator Emma Ripka began the forum by talking about her experience with international students. Ripka’s main approach to increasing international student involvement was based on communication. She said there’s no point in putting money into Students’ Union businesses if students don’t know what services apply to them. Her solution: creating a catalogue to explain what resources are available to student groups. She said the pamphlet would include all resources available to student groups such as popcorn machine and camera rentals. Vice-president (external) candidate Emma Ripka. Ripka also brought up her student skill sharing network database again, this time aiming it specifically towards international students. She said the network could be used for language swaps, collaborations between cultural groups, and the creation of multi-cultural events. 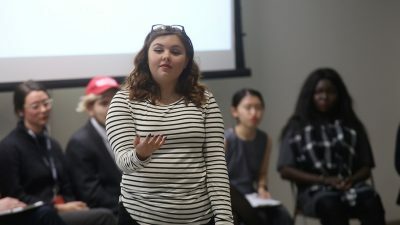 The ops-fi candidates were also asked about their relationship with the Student Events Initiative and how its passing or failing would affect their platform. Ripka said she supports the initiative and thinks it’s a great investment for the SU and students. If it fails, she said she believes there would be room to negotiate a different plan. When asked how she would provide funding to the International Students’ Association with a limited budget, Ripka said the SU could create a dedicated fee unit or student applied bursaries, whichever the ISA wants. From the audience, candidates were asked what they would do about the “terrible” scrambled eggs at L’Express. “I would consult with the manager of L’Express and express how bad the eggs are,” Ripka responded. “This can wait till Monday,” Straump said. In her opening statements, candidate Akanksha Bhatnagar said that as Student Governance Officer, she has found that international students are severely underrepresented in student governance. 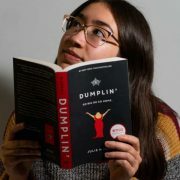 She said she wants to support their participation by including international students in the Students’ Union’s STRIDE program, which aims to get more underrepresented groups in student politics. She also wants to develop the Cultural Group Council which consists of over 25 cultural groups across campus. Vice-president (academic) candidate Tiffany Bruce. 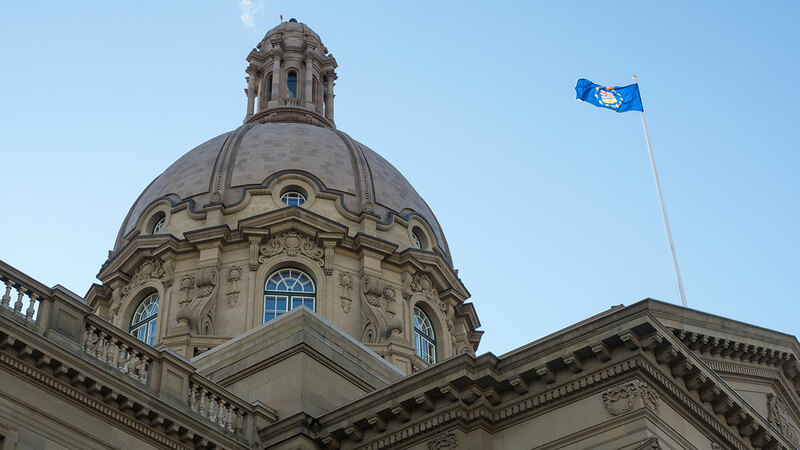 Candidate and science student Tiffany Bruce continued to stress her platform point of improving the transferability of credits from the University of Alberta to other institutions. 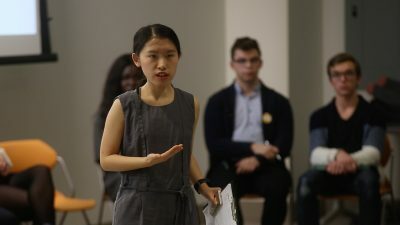 She argued that if the university continues to increase tuition for international students it should be easier for students to choose to transfer to a cheaper university. Vice-president (academic) candidate Cristiana Pop. In her introduction, candidate and AUFSJ councillor Cristiana Pop said she is “not here to make false promises to international students.” She said she recognizes that when international students are struggling, they are not going to get involved in activities outside their classes. To encourage affordability as a vice-president (academic) Pop wants to focus on the Open Educational Resources (OER) program, to save students money on academic materials. Later, the candidates were asked whether they support having faculty-specific Indigenous content or having mandatory Native Studies courses for all students. All three candidates said they support faculty-specific courses as Indigenous knowledge should be customized to each faculty and program. They said that it should be up to the faculty to decide what aspects of indigenous knowledge would be most relevant to students. Akrem Hammami, the president of the International Students’ Association, asked how the candidates would work to help the ISA improve their communications with International Student Services. He said there have been issues in the past between the two groups. Vice-president (academic) candidate Akanksha Bhatnagar. Bhatnagar touched on the difficulty of finding times for meetings to occur with the ISA because of the barriers international students face. 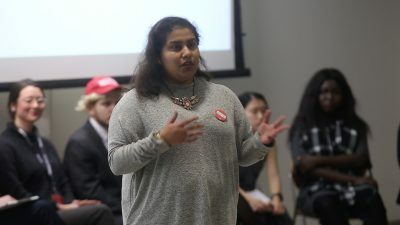 “If the International Students’ Association needs support to talk to International Student Services we will walk to International Student Services together and go right to them and ask them exactly why you aren’t able to access email lists to let students know about the services that you provide for them,” she said. Bruce had a different approach, saying they need someone with a “bigger voice” to talk to International Student Services. She suggested they need an “international task force” to come up with a plan and policy on how SU executives could support this communication. Pop said student associations don’t know about the academic resources available to them and that international student participation would suffer because of this. She said she wants to make sure these students know about these resources so they can be better supported in their advocacy. 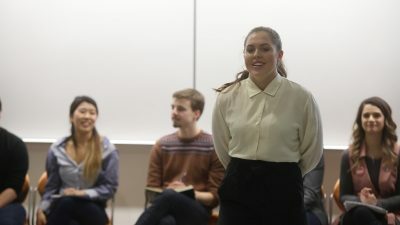 The vice-president (student life) candidates debated how to ease international students’ transition into Canadian life and promote their involvement in campus events. 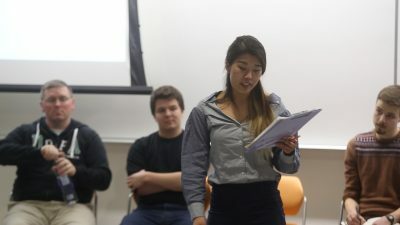 Vice-president (student life) candidate Michelle Kim teared up while stating her campaign platform, explaining how her experience as an immigrant and international student has led to strained finances on her family. International students represent 14 per cent of the student population, but are largely missing in student governance. Kim said she wants that to change. Vice-president (student life) candidate Stephen Raitz. Vice-president (student life) candidate Andre Bourgeois. 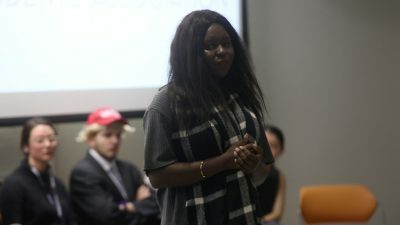 During open questioning, vice-president (student life) candidates were made aware that many international students are unable to attend Students’ Union events due to balancing part-time work. 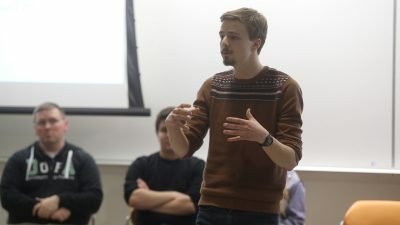 To increase participation, candidate Stephen Raitz said he would implement a “dual-pronged approach”: increasing grants for international student groups and increasing SU involvement to popularize international student events. 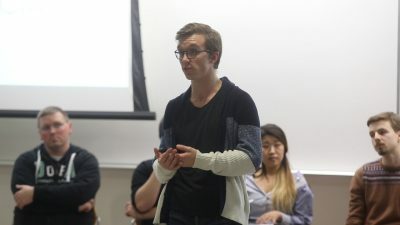 Candidate and Week of Welcome organizer Andre Bourgeois said participation is low because most SU events fail to represent international student interests. To facilitate change, Bourgeois wants to connect SU event planners with international student groups, utilizing venues and facilities already owned by the SU to bolster international student events. Vice-president (student life) candidate Michelle Kim. Kim believed international students will participate more in campus events if educational costs were lowered so students can spend less time trying to make ends meet. On easing culture shock for incoming international students, Bourgeois and Kim wanted SU services to be offered in multiple languages. Kim opted for multilingual peer support staff and Bourgeois wanted the UASUcares website translated into multiple languages. Raitz emphasized working from within international student groups to make a difference, reworking aspects of orientation to fit international student concerns. In their introductions, both candidates for Board of Governors representative followed a similar pattern as in previous forums. Board of Governors representative Yiming Chen. 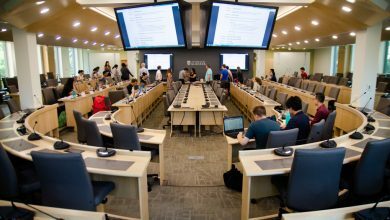 First-year international student Yiming Chen stuck to her scripted introduction, while open studies councillor Levi Flaman began with an explanation of the role of the Board of Governors. Flaman went on to blame rising international tuition on the university’s use of the Academic Price Index instead of the Consumer Price Index. Flaman also brought up resident meal plans, which he said pose a problem for international students who may want to buy groceries and make their own food but are not allowed to opt-out of the plans. 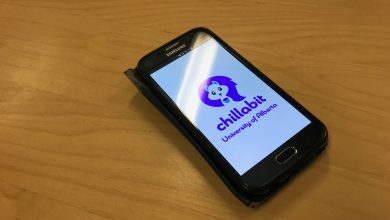 He said that considering the barriers international students face, he would push the Board of Governors to allow students to live stream or connect remotely to their meetings. An audience question asked how the candidates would persuade other members of the Board of Governors to take students’ interests into account when they vote on issues. Flaman said he would try to get to know board members personally to understand their interests and values as individuals. Board of Governors representative candidate Levi Flaman. Flaman said he felt that in doing this, board members would be able to relate to the desires of students better. He also said he hopes to help domestic and international students find common ground on issues so that student issues will come off as unified and stronger. He said he would retrieve feedback from students, and create tangible data to present to the board. Chen said she would also communicate with governors and seek the advice and experience of more experienced board members. Chen said she believes this could be achieved through having a strategy to persuade board members to see the student opinion as well as collecting data from students to know what their needs would be. “It’s about how you persuade others to hear your voice,” Chen said. “Yes” side spokesperson Daria Nordell tried to make the Student Events Initiative relevant to international students at the forum. The referendum is asking students if they will pay $8.25 per semester to fund Myer Horowitz renovations, as well as student grants. Nordell focused on how the renovations, grants, and programming would help build community on campus. Nordell was also pushed to explain that $6.50 of the $8.25 per semester fee that will be charged until 2020 (the fee will increase to $16.50 per semester after the Myer Horowitz Theatre renovation is complete) will go towards the theatre renovation itself, while the remaining funds will be split between the $100,000 in grants and $100,000 in programming. 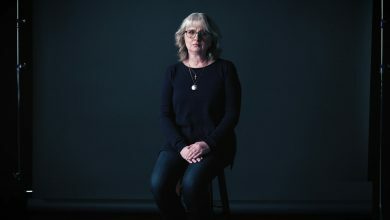 Finally, when Nordell was asked why the Student Events Initiative was created as a separate project instead of just raising Students’ Union fees to pay for the renovations and programming, she said it’s because “charging fees is a privilege” and students should be asked whether they support paying this fee.